The Burton tomb today (June 2008). The above-ground mausoleum of Sir Richard Francis Burton and Isabel Arundell, Lady Burton is a representation of a desert tent, its sandstone walls sculpted to resemble cloth rippling in a breeze. It would be an unusual design to find anywhere, but it is a particularly striking monument to find in a quiet English churchyard. In June 2008 I visited the Burton mausoleum in Mortlake, London, England. The visit greatly expanded my files of information, already bulging with every historical reference and photo I have been able to locate. Although questions remain and much work still needs to be done, I have written an extensive history of the tomb which will appear in some form — or several forms — at the appropriate time. This page is a condensed version of that report, and more details will be added here as I have time. 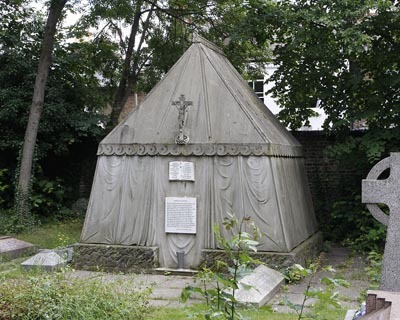 The tomb is located in the yard of St. Mary Magdalen's, a Roman Catholic church built in 1852 in Mortlake, which was then a village near London. A number of Isabel's family members were laid to rest in this spot, which, although now surrounded by Greater London, remains quiet and isolated. The mausoleum's design incorporates both Christian/Catholic elements such as the crucifix atop the front, a Star of Bethlehem emblem atop the front peak and what appear to be religious icons over each casket, and Islamic elements such as the crescent-and-star motif around the roof edge and Arabic lamps and vessels within. The top star and the crescents were originally gilded but the gilt, and the top star itself, are long gone. Isabel chose the design to fulfill Burton's wishes, expressed shortly before his death, that they “lie side by side in a tent” for eternity. The tomb was completed just before Burton's English funeral on 15 June 1891. Isabel was laid to rest in the tomb a few days after her death on 22 March 1896. “Fifty years hence London's ever-advancing tide will have swept away every vestige of the shabby sectarian cemetery where Richard Burton lies." 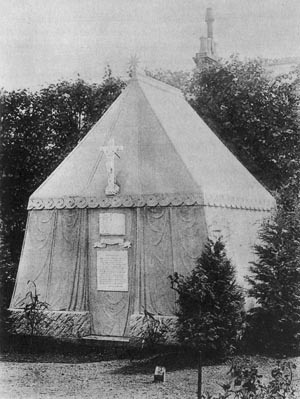 The Burton tomb circa 1891, after Richard had been laid to rest. (Isabel's half of the upper plaque is still blank.) Note the Star of Bethelem atop the front peak, the order of the plaques on the front door (including the ribbon) and the stone door slab with gap at bottom and open seams all around. 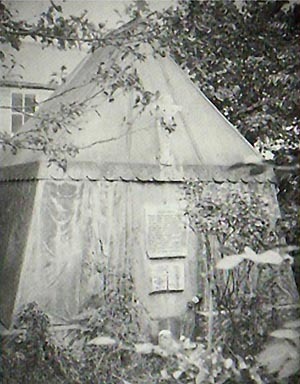 According to Mary S. Lovell in her 1998 Burton biography A Rage to Live, the design is neither that of a Bedouin tent (as is commonly stated) nor of a typical Arab tent. It is modeled on a tent Burton had made for his and Isabel's travels in Syria, whose principal feature was being tall enough for the 5'11" Burton to stand upright. The tomb was executed in Forest of Dean sandstone, a highly prized stone noted for its fine grain and even color, by Messrs Dyke, Stonemasons of Highgate, and rises to a roof peak about thirteen feet high. It was paid for by a public subscription of £668, loosely equivalent to $60-70,000 today. The tomb itself reportedly cost £460, with the balance of the funds raised going towards the funeral costs. The base ring, 12 feet by 11, is rough-cut York stone, and the interior floor is of white Carrarra marble with an inlaid black design. The door was originally of a style matched to the “tent,” of stone resembling a drop-cloth door and opening on metal hinges. It bore three marble plaques, one styled as an open book and bearing Richard and Isabel's life dates, a larger tablet containing a sonnet by Justin Huntly McCarthy, and a stone ribbon commemorating the donors who helped pay for the tomb separating the two. In deference to Burton's dislike of the dark, the tomb includes on its rear a window, which was once wire-reinforced stained glass. There are conflicting descriptions of this window's design but it is believed to have represented Burton's coat of arms, and perhaps a dove with outstretched wings. The Burton tomb has had an interesting history since its earliest days. A cycle of restorations and cleanups after periods of neglect and damage continues to the present day. There were at least three restorations through 1975. In 1920, Burton bibliographer Norman Penzer visited the tomb and found it lost among the trees and foliage, and the interior dirty and cobwebbed. He arranged to have the foliage cleared and the interior cleaned. 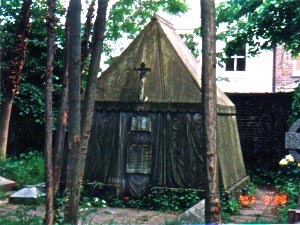 The tomb in about 1973. Note the door repair with the two plaques reversed. The 1974 restoration fixed this error and left the tomb in its best state in decades. By 1970, the tomb was again in a poor state of repair and showed the signs of some fifty years of neglect and vandalism. The window, reported damaged in 1962, had been smashed and covered with tin. The door was damaged at some point around 1970, possibly by vandals who may have been looking for “fabulous jewels,” although the mausoleum contains little of intrinsic value. In 1971, an American donor provided for the door's replacement with a seal of bricks and plaster. The job was haphazardly completed, though. One door plaque, the ribbon, was missing and not found despite a search of the church grounds, and the other two plaques were reinstalled in reversed positions. However, the tomb was securely sealed against vandalism and theft, as it remains today. 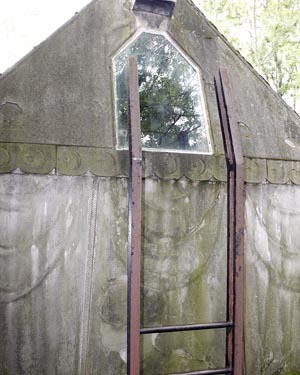 The rear of the tomb, with the window (now plate glass instead of the original stained glass) and the iron ladder by which the interior may be viewed. It is not clear what other maintenance may have been done in the 1971 effort, but by 1973 weeds and close-grown trees surrounded the tomb, and lichens covered much of the outer surface. 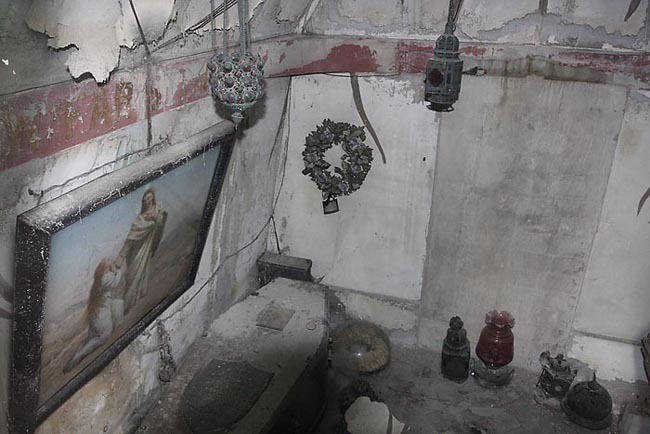 This led to one of the most thorough renovations in the mausoleum's history. This 1974 restoration was paid for by a subscription that raised £2,000. The exterior of the tomb was cleaned and restored and the surrounding growth cut back. The door seal was redone, this time with the plaques in their correct positions and the clothlike texturing of the surface. (The ribbon plaque remained missing and has never been located.) The window was replaced with reinforced plate glass, so that the interior can now be seen, and a sturdy iron ladder was placed behind to enable viewing. The Star of Bethlehem ornament was removed, or had been removed by this time, because it was too damaged or fragile to maintain. The rear roof ornament remained in place. The interior of the tomb was apparently not touched during this restoration, although several individuals, among them Donald Young and Quentin Keynes, were permitted to enter and observe the contents. As the restoration was partially sponsored by the Royal Geographical Society, RGS president L.P. Kirwan wrote a journal paper describing Keynes and Young's visit to the mausoleum interior. This paper is another important documentation of the tomb's contents and condition at a critical time. The restoration was dedicated and the mausoleum reopened to public access on 17 June 1975. 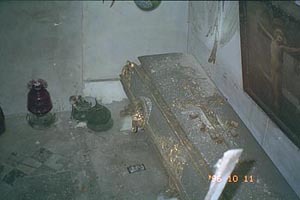 The tomb as photographed by Richard Leveson in October 1996. By 1996, the tomb had again grown somewhat shabby, with an outer coating of lichen and moss and nearby trees grown large. As the photos at right show, the situation had only gotten worse five years later, with moss more deeply encrusting the stone walls and ivy beginning to creep around the tomb's base. As the current photos taken on my June 2008 visit show, the tomb's exterior is again in acceptable condition. However, there are signs of returning moss and vegetation and the interior is in an increasingly dire state. Steps need to be taken immediately to preserve, protect and restore the mausoleum... and a continuing program of care and maintenance needs to be implemented and funded. A group has formed to take up this challenge and I have offered my services, including publicity and information hosting on this site, to help achieve the goal. Look for an expansion along these lines soon. Although the plate window and ladder installed some thirty years ago do not afford a perfect view of the interior, enough can be seen to make the view, and speculations about the more mysterious elements, fascinating. We are privileged to have Richard Leveson's photos of 1996 and 2001 to compare with the present day condition of the mausoleum's contents. Four of his images are reproduced below; to see these in larger form, as well as other photos and Leveson's own commentary, visit his website. 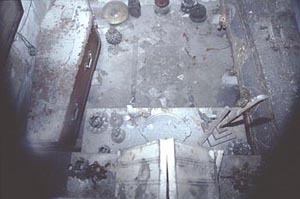 The mausoleum interior in October 1996. Burton's steel coffin is on the right, and Isabel's mahogany one on the right. 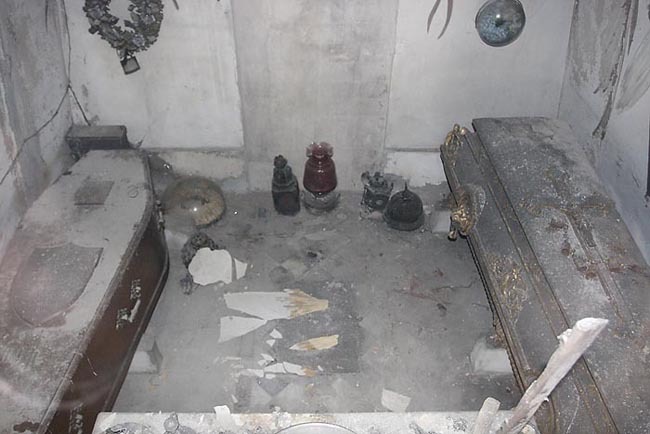 Note the photograph on the floor next to Burton's coffin, and the position of the black metal lamp near the door. The interior in August 2001. The marble altar with its marble tabernacle, water flasks and broken crucifix is more clearly seen in the right-hand photo. Note that the photograph on the floor has disappeared, probably blown under Burton's coffin by air passing through the ground vents. It was last reported seen in 2000. The interior as seen in June 2008. Note that the black lamp by the door has been moved. The ceiling angel over Isabel's coffin hangs in tatters, with large pieces on the floor. Both of these changes have occurred since the March 2003 conservation specialist's visit. The primary feature of the interior are the Burtons' caskets, Richard's of steel with gilt fixtures and Isabel's of mahogany. 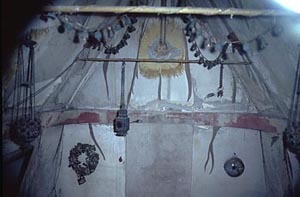 Three of four hanging lamps still hang from the roof support crossbars; the fourth, the black lamp on the floor near the door seal, had fallen by the time of Penzer's 1920 visit. Large religious paintings hang over each coffin, and two more, barely visible from the window, hang at the foot of each coffin, framing the marble altar. The altar, which can be seen just below the window, holds a marble tablernacle (the roof of which resembles a large face-down book in the photos), a large crucifix with the crossmember and figurine broken away, and several censers and candleholders. A large glass oval plate occupies the center. On the left of the altar as it is seen are two glass flasks of middle eastern style. It is believed that at least one contains water from the sacred well at Mecca, brought back by Burton and kept for almost forty years. 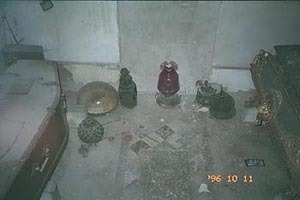 Other items seen in the photos are oil lamps, a charcoal brazier (the round black object near the head of Burton's coffin), a string of camel bells atop Burton's coffin, and several decorative wreaths, one of metal and two enclosed in glass domes. Of particular interest are the four strings of camel bells hanging from the ceiling. Each goes to a small electrical “shaker” that is wired to a large battery seen at head of Isabel's coffin. A switch atop the door, still in place, would close the circuit and make the camel bells tinkle when the door was opened. St. Mary Magdalen's Church has a hidden treasure of interest to Burton aficionados: a stained glass window memorializing Burton, donated by Isabel. There is a short web page and photos on their web site (see below). I am in the process of gathering more information to create a detailed page on the window here on this site. 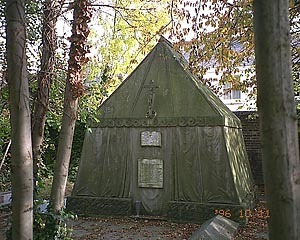 The Burton tomb is located in the churchyard of St. Mary Magdalen's Church, Mortlake, London, England, just south of a bend in the River Thames and about six miles west-southwest of the city center. It stands in a quiet area just behind the church, with a wall behind it and a lane and private homes beyond. St. Mary Magdalen's has a very nice web site which includes information about the Burton tomb and the Burton memorial window. (Select "Sat" mode if it is not selected by default.) This view shows the church in the lower left corner. The Burton tomb is the largest mausoleum in the churchyard, at the center of the map image. Zoom in by double-clicking on that spot or by clicking on the + and – zoom buttons. To locate the tomb in other mapping tools (such as Google Earth), use the digital coordinates 51.468454, -0.261465. These point to the very center of the tomb. It is easy to visit the Burton tomb any time you have two or three hours to spare in London. Note that there are several churches with similar or identical names in London, and the designation “Mortlake” covers quite a bit of ground, including at least two cemeteries so designated. This church, and the tomb, are on North Worple Way, found on map 115, index K-3 of the London A-Z map book. The church can be reached by most convenient means. From central London, I found it easiest to take the Underground's District Line to Richmond, then catch the National Rail line for the one-mile jaunt to the Mortlake station. (Not all trains stop at Mortlake; ask to be sure.) You could also walk this distance. The church is about 100 yards further along North Worple Street from the Mortlake station. Hours and visiting information can be found on the church's web site. Are you planning a visit to the tomb? Please do contact me for tips and suggestions to get the most from your visit. If you are a photographer or are otherwise interested in assisting me gain a few more details, please do contact me before you go! Description of the tomb's construction from A Rage to Live, Mary S. Lovell, 1998. Image of the tomb ca. 1891 from Sir Richard Burton's Wife, Jean Burton, 1941. It has been reproduced many times and I am not certain of the original publication, photographer or other credit. Description of the tomb in 1891 from the Thames Valley Times article of 17 June 1891, as quoted at length on www.richmond.gov.uk. All material	on this site is from and in the public domain unless specifically credited. Complete copyright information can be found on the About page. All original material including content, design, organization & layout ©2008 James D. Gifford.